Thank you for your interest in working with me! My Innovation Training focuses primarily on helping people and organizations to think creatively and to build their own innovation capabilities. 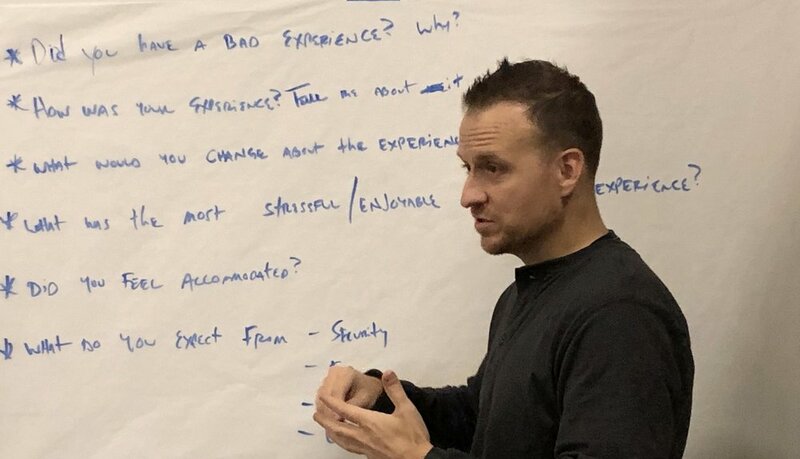 I do this by teaching the fundamentals of innovation through human centered design and innovation frameworks in a 2-day workshop that takes you from an innovation novice to a confident and competent innovation practitioner. For those looking for custom workshop trainings, I have also created custom innovation trainings for clients in various formats and durations (e.g. 1/2, 1, 2, & 3 day workshops). Teaching people and organizations to innovate is what I do best and what I’m most passionate about. In just the past 3 years I’ve taught over 1000 people to think creatively and innovate at their jobs more effectively. If you or your organization are interested in working with me, please submit an Innovation Training request using the form at the bottom of this page. I generally accept two speaking or workshop engagement per month. Slots for 2019 are being booked now. To submit a speaking request, please fill out the form at the bottom of the page. Organizations and businesses often find it hard to brainstorm new ideas, concepts, and solutions in their work. I help them address this challenge by working with them to understand their needs and goals, designing a custom workshop(s), and then facilitating these session(s) among small and large groups of people (i.e. staff, users, leadership, and/or key stakeholders). If you are interested, please submit a workshop request using the form below. Tell me your goals for the engagement. How can I help?